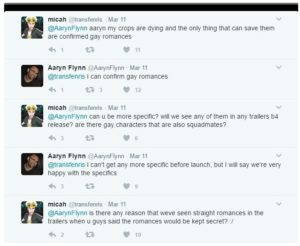 In a tweet by Aaryn Flynn, it is noted that Mass Effect Andromeda gay romances have been confirmed. As Mass Effect has been a worldwide sensation and has touched the hearts of sci-fi fanatics, third-person shooter enthusiasts and experts, one may think that anything is possible in the world of Mass Effect ( given the wide-depth of space exploration, usage of state-of-the-art weaponry and a level of interaction which is quite diverse from different sci-fi games which makes the game a unique experience for people who love the Mass Effect video game and for those just learning the game). Indeed, the goal of Mass Effect is exploring new worlds and not dying in the process; as such the game does not only explore the sci-fi and action genre but also delves with the romance genre as well. 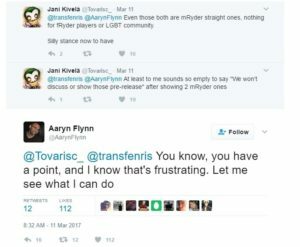 With this tweet, fans have been quite thankful and appreciative to Aaryn Flynn in regards to this latest update and are very much looking forward to this development in the game. This just goes to show that Mass Effect Andromeda is open for all to play regardless of their orientation and it is a game to be looked forward to. Mass Effect Andromeda arrives on the Playstation 4, XBox One and PC on March 21. XBox One and PC players have a leg up on their PS4 counterparts though, because they can access a free trial for the game through the EA/Origin Access programs starting March 16. Thanks for sharing your thoughts, Josh. Hope you still find some enjoyment in the game, in spite of its glaring flaws. Nah, it’s always good to hear people’s insights. 🙂 Here’s hoping for better diversity and better games altogether.